Our Cold & Flu Formula is a combination of two very popular formulas: Yin Qiao San and Gan Mao Ling. These are two of the most useful formulas for helping symptoms of colds and flus. Our Cold & Flu Formula is a combination of two very popular formulas: Yin Qiao San and Gan Mao Ling. These are the two most useful formulas for treating colds and flus. Yin Qiao San herbal formula was first published in 1798 by Dr. Wu Ju Tong. 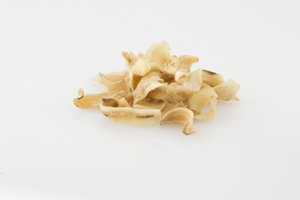 It is incredibly effective at helping invasion of wind-heat in Chinese medicine. Wind heat often manifests as common cold or flu symptoms when there is sore throat, fever, and aches. Gan Mao Ling translates to “effective remedy for cold and flu.” This formula treats what is called wind-cold conditions: colds and flus that present with clear runny nasal discharge, watery eyes, stiff neck, and chills. 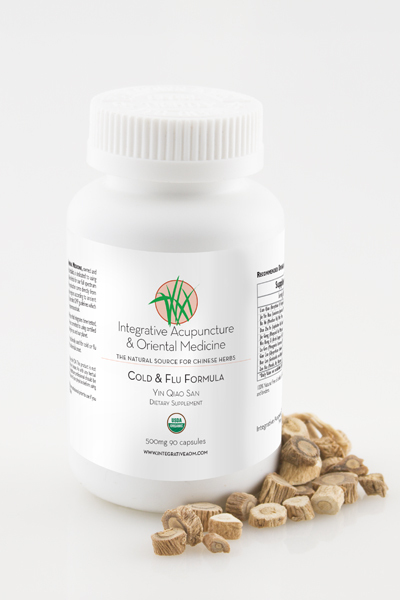 Our Cold & Flu formula can effectively prevent and reduce symptoms associated with the common cold and flu. Ingredients: Organic Forsythia Fruit (Lian Qiao), Organic Honeysuckle Flower (Jin Yin Hua), Organic Mint (Bo He), Organic Bamboo (Leaf Dan Zhu Ye), Organic Platycodon Root (Jie Geng), Organic Burdock Root (Niu Bang Zi), Organic Reed Rhizome (Lu Gen), Organic Licorice Root (Gan Cao), Organic Isatis (Ban Lan Gen), Organic Yunnan Rhizome (Zao Xiu), Gelatin capsule. Mint is widely known as a culinary herb but also has powerful medicinal applications. Mint is cooling, pungent and aromatic. It is used around the world to treat a variety of conditions such as rashes, eye conditions, diarrhea, dysmenorrhea, gas, neuralgia, gallbladder disorders, and upper respiratory infections. In Chinese medicine it clears heat from the body and moves liver qi. Mint oil has been shown to inhibit staphylococcus aureus, staphylococcus albus and streptococcus, and viruses such as herpes simplex. This bamboo is native to China and grows like a grass without a ridged stalk. The leaves are gathered in summer, dried and cut. It is sweet, cool, and bland. In Chinese medicine it is used to clear heat from the heart and small intestine to treat conditions such as fevers, sore throat, canker sores, swollen or bleeding gums. Burdock Root is grows abundantly around the world and is a member of the thistle family. The root is used by herbalists across many cultures for its ability to cleanse the liver, moderate blood sugar and heal digestive conditions. It contains high amount of inulin and mucilage that are healing for the gut. In Chinese medicine it is combined with other herbs to treat sore throats, tonsillitis, and colds. Many skin conditions like psoriasis, eczema, contact dermatitis and acne, are healed with the use of burdock. 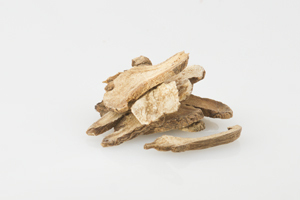 Reed Rhizome is native to China and is said to have a sweet cold taste. 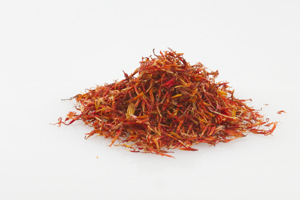 It helps the body release excessive heat and is especially well known to quench thirst. It is also used to treat fevers, reduce thick yellow sputum during a cold or flu, and reduce excessive thirst. Isatis is very effective at treating conditions of the throat: sore throat, mumps, and tonsillitis. 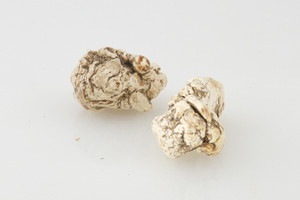 Isatis herb is cold in nature and has antiviral properties. It helps reduce feverish conditions that accompany the flu by removing pyrogens produced by bacteria that cause body temperature to rise during a fever. Is effective at treating any kind of pain. It has anti-bacterial effect and inhibits viruses such as shingles, typhoid, staph and meningococcal diseases. Helps prevent and treat colds and flu. 3-6 capsules every 3 hours for the first day of symptoms. After that reduce to one dose every 4-5 hours while symptoms are present. You can also use preventatively before airplane or other travel, or in any other circumstances that increase your exposure.